1. 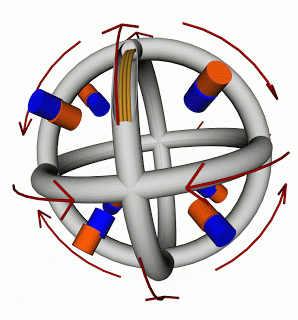 Uniform strength in the magnetic field. 2. Uniform symmetry in the magnetic field. 3. Smooth rings, allowing for plasma recirculation and reduction of arching. 4. Electrically insulated or “magnetically transparent” materials elsewhere. 5. Reducing plasma counter streaming. The rings are a symmetric structure. It has a center, 8 corners, 6 sides and 8 joints. We know in the center there is no magnetic field. This is the null point. Electrons or ions move straight through this region. We know this from theory, papers and simulations (http://www.youtube.com/watch?v=ao0Erhsnor4). This straight motion hurts electron containment – overtime, it will scatter the electrons. If you want to find the magnetic field you apply the Biot-Savart law at each point (joint, corner, axis). I developed simple equations for the field at each point. These were integrate into MATLAB and EXCEL code, as well as compared against publications. I applied these equations to the WB6 design. I then moved the rings outward. I recalculated the field as the rings moves. I plotted the results and they were surprising. WB6 was designed so the field at the axis and corner were close, if not the same. I would bet that ideally, we would want identical field strength, if it were physically possible. Bottom line: if your an electron in the center and you move any direction outward, you should encounter a field uniform in strength and symmetric. It analogous to an above ground pool - the walls must be uniform in height, otherwise water leaks out. The design must strive for uniform magnetic strength and direction, otherwise more electrons will leak out. Rider, Nevins, Dolan and Bussard all talk about recirculation. It was recirculation which prompted Endoliths design. Recirculation means encouraging material to move back and forth, or in and out of the ring structure, without hitting something. That is one reason why I am in favor of an open design with no sharp edges or corners. This might sound simple, but both Convergent Scientifics Inc. patent and the Iranian 2011 publication ignores this rule. Maybe they have a different plan of attack? Conduction and recirculation are opposites. Conduction loss is when ions or electrons touch a surface and are lost. They take their energy with them away from the machine. We need to minimize conduction loss. This means rings which are smooth. It means fields which are curved into circles and do not run into surfaces. Curved fields are not perfect, plasma drifts outward from the center tracks to the edges over time. Tokamaks suffer from this "drift velocity" as well. But its where we need to go with ring design. The rings must also be smooth to avoid arching. If their is a bump, charge can buildup here. This can lead to sparks between surfaces. In practice, the rings must be held with struts, connectors and legs. These parts hurt the ideal design, but cannot be avoided. Here, we must choose materials which avoid hurting operation. "Magnetically transparent" materials are ones which have a magnetic permeability of ~1. This means magnetically, they act like vacuum. A good example is Teflon. Teflon was used by Mark Suppes and the Sydney team for their ring design. Pure Teflon has an extremely low electrical conductivity. This will help against arching. The material is also cheap and easily machinable. It has some problems with out-gassing in a vacuum, there maybe lots of pockets of gas inside which need removal. Bussard also described electrically insulated surfaces. This was mainly to eliminate arching and conduction loss. There was arching in WB6 tests. When charged particles move past one another in streams, it can lead to instabilities. Marshall Rosenbluth developed most of the understanding on this topic. He modeled (+) and (-) streams of particles passing one another, and showed that the streams devolve into a disorganized mess. The rings try to mitigate this problem by point the field in through the axis and out everywhere else. Fields pointing in opposite directions never run parallel to one another. This will not stop counter streaming or plasma instabilities in general from being an issue. I expect researchers will need to deal with this going forward. The illustration shows "merged ring magnets" While for the point cusps this may be ok, but consider what is happening where the loops meet. One set of wires turn one way, and a separate set of wires turn the opposite way. This leads to a cusp at these intersect points and possibly very importantly these cusps run directly into the metal- no chance for recirculation her. Bussard stated that the bare minimum of exposed metal could only be ~ 1/10,000th of the surface area of the machine. I don't know what these cusps would add up to, I suspect it would be similar to the nubs in WB6, and Nebel stated that this was a problem with WB7.0 and modifications was made in WB7.1 to mitigate this problem. I don't know if the modification involved making the nubs smaller, more bowed, adding more magnetic insulating windings, or moving to wall standoffs without any bridging nubs between the magnets. The wall standoffs are acting as bridges between the magnets, but they would tend to be exposed at radii well beyond the action at the midplane of the magnets. The bowed magnet loops, as opposed to planer shapes have been illustrated before but the question of the geometry of the cusps in this altered geometry and the effects on Wiffleball effects, etc are unexplored (in the available literature). Bussard considered the Polywell for many years and to my knowledge he never promoted this feature. To improve sphericity he proposed more planer magnets, not curving the magnets relative to the radius from the center. I thus suspect that this is unfavorable and possibly even catastrophic. Such a shape of magnetically shielded grids have been put forward in Fusor designs and while it may decrease the plasma hitting the grids, no claims of increasing density (part of Wiffleball effect) was put forward. The use of teflon by the Austrailians was a short cut which I believe they have abandoned. It is convient for machining, and electrical insulation, but as a plastic it's out gassing properties, especially under plasma bombardment (magnetic shielding decreases the bombardment but does not totally eliminate it due to ExB drift) is possible tremendous. As a comparison, the energy loss (primarily the electrons?) through the cusps was ~ 100 times worse than ExB drift losses. Improved recirculation would bring these numbers closer together. At ~500,000 Watts of input power in WB6, 1 percent would represent ~ 5,000 Watts of power hitting the magnets through ExB drift. Even well outgassed stainless steel presents problems. I understand that Nebel implied that this outgassing problem gets worse as machine size decreases (surface area to volume ratio increases) and that was why he felt testing of smaller sized Polywells was not rewarding at this stage of research. Of course third parties that are trying to replicate or expand on the data set may get useful (to them) information, but presumably EMC2 feels that they are beyond that level. I feel that while the signal to noise levels suffer and complications of smaller scale engineering are more rampant, useful information might be gained about gas handling, pumping, electron and ion guns, geometry, etc . and be useful for future design- ie: engineering issues. The physics not so much, but replicating with sufficient accuracy the paramount Wiffleball and Beta claims might be doable if outgassing issues can be managed. PS: Outgassing has nothing to due with confinement directly. Hydrogen, water and other molecules are actually absorbed into the metal or other materials to sometimes astounding quantities. Under hard vacuum these molecules start leaching out of the metal and can cause all sorts of havoc. Heating the metal makes it even worse. The vacuum industry has spent considerable efforts in managing this issue.